I must begin by saying that my week is always complete when I get to read Jen Robinson's Sunday Afternoon Visits. They are so insightful and bring me to new information each week. This week something she wrote about caught my eye, for whatever reason, and I thought it was kind of interesting. So, I am sharing it with you as well. The site is called Kidderlit. It is a twitter. What is a twitter you say? I say that as well. I still plan to look up exactly what a twitter means, and maybe I will post it here when I do, or maybe you already know or don't really care. The important thing to know is that this site plans to post the first line of a children's or young adult book each day. The trick is, there is no title or author listed in the post. You must click on the link to Amazon to find out who wrote the book and what the book is called. INTERESTING.... It looks like it just started, so I guess we will see. September Carnival of Children's Literature! The September Carnival of Children's Literature is up at Charlotte's Library! Some of you may have recently read the post I had about the author, Barbara O'Connor, who wrote about reading my blog on her own blog. Oddly enough I had just checked out her book How to Steal a Dog from my local library. I waited the entire summer to get my hands on that book! It was ordered in June, but did not surface until about a week ago. Now, I promise I am not saying this just because Ms. O'Connor may read this blog, but the book was perfect! I am always looking for books that are just right for a fifth grader and this is one of them. The moral of this story can be summed up in this line from book, "I guess bad times can make a person do bad things, huh?" To give you an idea of what those bad things are, listen to this perfect grabber lead "The day I decided to steal a dog was the same day my best friend, Luanne Godfrey, found out I lived in a car. The story has wonderful messages about morality and it takes a daring look at homelessness, a topic not often talked about in children's literature. I just know there is a kid out there, in your room, in your life, in your mind, who has felt hopeless and helpless and possibly done something out of the ordinary to deal with this pain. The story also has the main character, Georgina, writing in a notebook as well. HOW AWESOME?! The book is a quick read with an easy to follow, but not overly predictable plot. The vocabulary is not over-done for a read aloud for the fourth and fifth grade crowd. Even though the idea of stealing a dog isn't exactly moral, I would say any fifth grade student could see through that to the real point of the story. I will be asking my school librarian to get this book on our bookshelves in a hurry. I just know as soon as I show to my students, they are going to be racing to the shelves! I finished this book a couple of days ago, but I needed time to think about it and let it sink in my brain and heart. Whenever I read a great book, I feel a huge sense of dread and insecurity that my blog won't do it justice. With that being said, I will do my best to review the book Wednesday Wars by Gary D. Schmidt. Again, I am so bad about saying I love books, but I just LOVED IT! The concept of the plot is the main character, Holling Hoodhood, (yes, that is his name...) believes his teacher hates him. And, sadly enough, she just may. Not that teachers ever think in terms of hate, but what she felt for the student in the beginning certainly could not be considered love. The book is set in 1967, in the suburbs of Long Island. Every Wednesday afternoon at the school, the seventh grade students either leave to go to the Jewish synagogue or the Catholic church for Hebrew School or Catechism. Every student that is except for the lone Presbyterian, Holling. Thus leaving the teacher with one student in her charge. Now teachers, think for a moment... A chance for a free period ruined by one poor Presbyterian. The teacher is now forced to come up with something to do with that one student. She begins by having Holling do the menial job of eraser clapping. This job ends in a hilarious incident of chalk dust spread all over some cream puffs which are soon to be consumed by unwitting Wives of Vietnam Soldiers. When Mrs. Baker, the teacher, figures out this is not the way to go, she then turns to Shakespeare. She introduces Holling to the works of Shakespeare which also seems to be a mistake at first. The story goes on to follow the relationship of teacher and student. This relationship goes further than one could ever expect. It goes from a student "knowing" the teacher "hates" him to the student in the end realizing he has no better "coach" in his corner. The plot also follows the relationship between the main character and his father, his sister, and of course what would a YA book be without a relationship with a girl. I am now and always will be a fan of Gary D. Schmidt. I love his character development, plot twists and turns, and his humor. This book will have you laughing, crying, cringing, and pulling for everyone you meet in the course of the story. Not to be missed is the intertwining of history throughout. For a time period I know little about, The Vietnam War, I grew to really appreciate the hardships of everyone involved. This book is best made for students in 7th grade or higher. It is remarkable at best. THE ONLY criticism I have is a criticism I have had in all Schmidt's books... WHAT IS UP WITH THE NAMES? I hate the choice for character names. I do not like getting caught up on how I should pronounce some character's name. I kind of just rename them in my head so I can focus on the story at hand. I know there is some reason for his choices, but come on... Holling Hoodhood? Who would have that name? Run to your bookstore, flee to the library, merrily move your fingers to Amazon and check this book out! Yes, I am again in awe that someone would come and look at my little blog, but they did and here I am. And on the blog of a famous writer to boot! (Barbara O'Connor) How cool am I today? Don't answer that aloud, I already know the answer you are looking for... VERY COOL! I saw this book mark on The Longstockings and I decided to look into it further. It is so... what is the tween word of the week? I'll go with "cool." It is not exactly for my age student but how stellar would it be to receive a bookmark like this from your 6th or 7th grade teacher? You can find it here at the ALA Store. I am going to start thinking up a "Top 10" for a little younger, 4th or 5th grade. Any ideas...? Harry Sue by Sue Stauffacher is certainly one interesting book. From the title, to the prison lingo (Joint Jive) glossary, to the concept of the plot. I must say I thoroughly enjoyed the book. 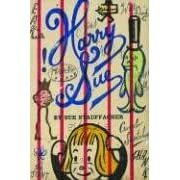 In the past I have read two other books by Stauffacher, both about a main character named Franklin Delano Donuthead, so I was not surprised by Stauffacher naming her main character Harry Sue, but none the less it was hard to get use to reading about a sweet main character named who was named Harry Sue. Harry Sue is such a layered novel. The characters are all so unbelievable they are believable... especially if you are a teacher and have seen any dysfunction. Which of course we all have. I would recommend the story to an older reader because I feel the significance would be greater and the message would carry more weight with someone in 7th or 8th grade. Harry Sue is the daughter of two convicts and is "doing her own time in life" living with a horribly cruel grandmother who scams unwitting parents into leaving their innocent children in her care at a crummy daycare. Harry Sue wants nothing more than to meet up with her long lost mother in the "clink." She has learned lots of "Joint Jive" and speaks to the reader using phrases such as "con" (male convict), "conette" (female convict), "fish" (new convict), and my very favorite "J-cat" (someone in the "ding-wing" aka: a nut) I am definitely going to start using that one. Oh yeah...One more neat factor is the way Stauffacher sprinkles the book with quotes from Harry Sue's favorite book The Wizard of Oz. When Jen Barney from A Teacher's Life mentioned having her students write words of inspiration in their writer's notebook in this entry titled My Wonderful Room, I had to find out more! Especially since the first day we sat down to write I had a cute little red head boy in tears because there was "no way in the world he could write that much!" -- His words, not mine. So Jen came over here to Read, Read, Read and told me exactly how to inspire. The very next day I sat down with the students and gave it a shot. The most important part of this process was the picture book used to make the point. The book I used was The Dot by Peter H. Reynolds. The Dot is the perfect story of inspiration! It is a small picture book in which a young girl is sure she is unable to express herself artistically. Her teacher quickly inspires her showing that she CAN be an artist and in fact IS an artist. In turn, Vashti, the young girl, inspires a young boy who also feels he CAN'T draw. After reading this book, we talked about inspiration and how we can use words to inspire one another. We started a small list of inspirational phrases you could say to someone. Some of the phrases we wrote were "You can do it," "Never give up," "Do your best," and my personal favorite "May the pen be with you." (A boy in my homeroom gave that one and we all thought it was funny) We all went back to our seats, opened to the back of our Writer's Notebooks, and titled a page "Inspiration." Students then let each person at their table write a line of inspiration in their WN. The lines needed to be original, no repeats, and they needed to write their name beside the entry. Later we switched around until everyone in the class had written in each WN. It was amazing! The kids loved the inspiring thoughts. They shared their favorites aloud and I think they could have gone on writing inspiration for the rest of the year. The next time we got out our Writer's Notebooks, their were no more tears. Here is a website specifically dedicated to The Dot. I especially like the "Questions and Answers" section which does a little slide show presenting The Dot in the many different languages in which it is translated. Marshfield Dreams:When I Was a Kid by one of my favorite writing gurus, Ralph Fletcher, is the perfect book for introducing memoir writing to my students. I read about this book earlier in the summer and I couldn't figure out how it got past me. Then I forgot about it again! Finally when I went to order Fletcher's Walking Trees I was reminded by Amazon to order Marshfield Dreams. I am so glad I did. It is an incredibly easy read, taking me about an hour. It is beautifully illustrated with photographs of Ralph Fletcher's childhood and family. Fletcher takes us into his life as the oldest of nine children. He begins the book with a map of his neighborhood, which is a technique he teaches in A Writer's Notebook: Unlocking the Writer within You. Within the short chapters, Fletcher recounts the funny, touching, and interesting events which occurred during his childhood in Marshfield, Massachuestts. Students will love the stories either on their own or read in total as a read aloud. You wouldn't necessarily need to read them in order or even all at once. Although I think on a whole, I would read it straight through letting students soak up Fletcher's life as it unfolds in the pages of the book. I was going to mention one of my favorite stories in the book, but there are too many to decide which was my favorite. One problem I did have, however was Fletcher mentioned in the beginning of the book that he was one of nine, yet the book only talked about 8 kids including a picture in the chapter titled The First Team. I know the book wasn't his WHOLE life, so there must have been another child later, but that left me wanting to know more. This will become a perfect part of my repertoire of mini lessons for Writing Workshop. Well, it all started a few days back. (Or maybe it was a week or two, I can't be sure at this point.) Anyway, I was reading through all the blogs I like to follow, and I decided to adapt, okay not adapt but borrow, okay not borrow but steal this outline for the first half of the year in writing workshop from Stacey Shubitz on Two Writing Teachers. As I was reading through her set-up and changing it to fit my own class (see I really was adapting) I kept noticing the name of an author referenced that I didn't know. The author was Jim Vopat and his book was Micro Lessons in Writing. I promptly ordered it (which is not really an it or book but more of a set of books) because it seemed if I was following Stacey's outline I was going to be lost without this book. I just finished reading the first book of the set in less time than it would take me to pluck my eyebrows. Let me just say, YOU MUST GET WITH IT AND CHECK THIS OUT! In the Welcome section of the book, Volpat says, "Here is the medium is the message: a minimal book format with minimal text, one micro lesson per page, an invitation for you the teacher to complete the narrative with your students through their writing. Less is more." Perfect... I'll take it. There were way too many cool lessons in the first book alone (Big Ideas For Getting Started). Some I knew, some I needed to hear again, and some I had never thought of before. One was in the section of Identifying as a writer. It was titled Celebrity Writer Profile. You'll have to see the book for more details of this lesson, but the idea is to get kids to relate themselves to being a writer. I liked that the questions used in the sample were like the ones I use from my Writing Interview I usually have students complete. The interview has outworn its welcome because it is long and kids always complain about doing it. This solves that problem. There is another lesson in the section Writing Groups called We Are. Again... get the book for a more detailed explanation. The idea here is to group students in 4 or 5 and have them come up with a group name. Next they come up with a topic they would like to write about for the next meeting. Then they are free to write as they wish. They can write in their own genre, style, voice, etc. At the next meeting they share what they wrote. AWESOME! Lastly, in the end of the book Vopat shares his inspirations for the different ideas. Who doesn't love that?